ATLANTA, GA - One night. One shot. No safety net. 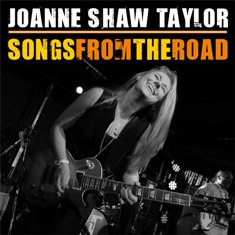 If there was pressure afoot as Joanne Shaw Taylor walked onstage at The Borderline club in the U.K. on May 12th, 2013, then the bandleader used it as rocket-fuel, channeling the vibe into the set of her life. Now, that explosive performance is captured on Songs From The Road: a live album with the soul power to jostle the greats off the podium, coming November 12 on Ruf Records. A seasoned road-warrior since 2009’s debut album, White Sugar, Joanne has nothing to fear from the stage, but the demands of her diary meant Songs From The Road presented a logistical challenge. “We only had one chance to do it because of my schedule,” she reflects. “If I’d have played terribly – which fortunately I don’t think I did – it would have been unusable. It worked out really well, and I think a big part of that is because the fans were so good. If the crowd brought the atmosphere, then Joanne brought the songs. While some bands merely sleepwalk through the hits live, Songs From The Road finds the bandleader pulling her back catalogue around by the hair, ensuring that from early favorites like Going Home to current roof-raisers like Soul Station, these songs are very different beasts to the studio originals. Sold out venues. Screaming crowds. Her name in lights. Joanne Shaw Taylor never anticipated any of that at the start. Back then, she was just an ordinary “black country” schoolgirl, bored with the disposable pop she heard on the radio growing up in her native Birmingham, England, rifling through her father’s record collection for sunken treasure, and falling for albums by SRV, Albert Collins and Jimi Hendrix. “Guitars were lying around the house,”recalls Joanne. At 13, she’d picked up her first electric and practiced every minute. Reflecting on his first impressions, Stewart recalls that “she made the hairs on the back of my neck stand on end.” His call the following day proved the start of a lasting friendship, with Joanne seeking his advice on the industry and even accompanying his DUP supergroup across Europe in 2002. “I never really wrote songs until I was 21.” Suddenly the dam broke. In 2008, Ruf won the rush for Joanne’s signature, and soon she was working with veteran producer Jim Gaines (Carlos Santana, Johnny Lang, SRV), bassist Dave Smith and drummer Steve Potts on the songs that became her debut album, White Sugar. Since then, it’s gone stratospheric, with Joanne breaking into the notoriously hard-to-crack U.S. market, beating the stereotypes of her age and gender, and being watched by 17 million viewers as she played an angel-winged solo during Annie Lennox’s set at Queen Elizabeth’s 2012 Diamond Jubilee Concert. That same summer gave us Almost Always Never: a bar-raising third album that found Joanne dodging expectations, writing the songs her muse dictated, and diving in at the deep end with just her talent to keep her afloat.